Israel on Friday showed interest in strengthening cooperation with Punjab on a wide range of subjects, including exchange of technology, police and security training, agriculture & irrigation, dairy farming, as well as promotion of private investment in the state.At a meeting between Punjab Chief Minister Captain Amarinder Singh and Israel’s ambassador to India, Mr. Daniel Carmon, the two sides also decided to explore the possibility of setting up Punjab-Israel working groups for continuous dialogue on issues of mutual interest. The Chief Minister promised to take up the matter with the External Affairs Ministry, after the Israeli envoy suggested the formation of such groups for long-term cooperation, according to Mr. Raveen Thukral, Media Advisor to the Punjab CM.Besides Mr. Thukral, others who joined the Chief Minister in the meeting included Chief Principal Secretary Mr. Suresh Kumar, DGP Mr. Suresh Arora, ADGP Intelligence Mr Dinkar Gupta, Special Chief Secretary (Horticulture and Forests) Mr. Himmat Singh and Punjab Resident Commissioner in Delhi Mr. Rahul Bhandari. 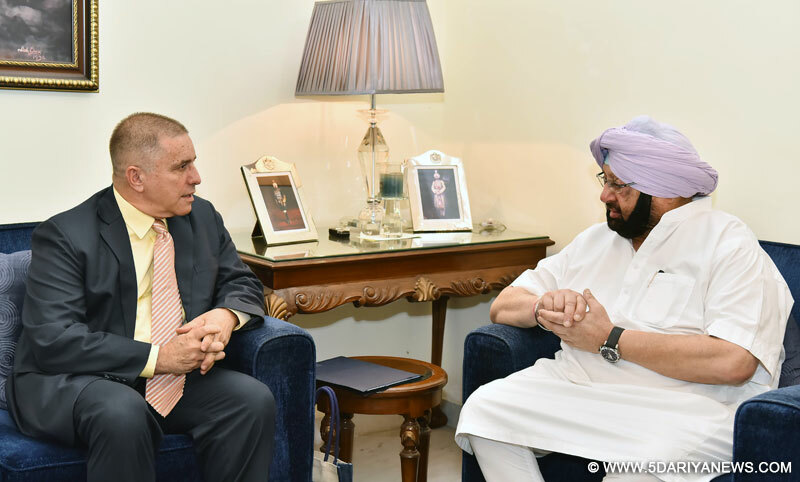 Captain Amarinder also suggested to Israel to set up an agriculture implements manufacturing facility in Punjab, besides helping the state in providing effective cold storage solutions for agricultural produce.Pointing out that the dairy yield of Israeli cows was among the top three in the world, Mr. Carmon offered to provide Punjab with embryo transfer and artificial insemination technologies to scale up the dairy farming business in the state.The two sides also discussed cooperation in police/security training, which the Israeli ambassador said could be arranged either in his country or in Punjab. The possibility of setting up a Punjab Special Operation Group for training could also be considered, Captain Amarinder and Mr. Carmon agreed. It may be noted that Israel already has an agreement with the Ministry of Home Affairs, Govt of India, on homeland security and anti-terror activities.Exchange of agricultural and other experts as an ongoing measure to boost cooperation between the two sides will continue to be undertaken on priority, the two sides further agreed.